Cook Spaghetti according to package directions, just until al dente. Drain well and set aside. Add peppers and onions to skillet and saute until they are soft. Add cream cheese and milk to skillet and stir until well combined. Set aside. In a medium bowl mix the cooked beef and spaghetti sauce. 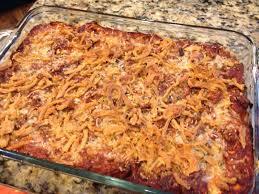 In a 9×13 inch baking dish, add about 1/3 of a cup of sauce-meat mixture, and spread to cover bottom of dish. Add all the spaghetti to baking dish and spread out evenly. Add the cream cheese-veggie mixture to baking dish and spread out evenly. Add the sauce-meat mixture to baking dish and spread out evenly. Top casserole with Parmesan cheese. Bake in preheat oven until casserole is baked through the center, about 25 minutes. This entry was posted in Recipes and tagged Baked Cream Cheesy Spaghetti, Baked Cream Cheesy Spaghetti recipe on August 30, 2017 by admin.